Ever wondered if life as a homesteader is all it’s cracked up to be? Ever wish someone would just sit down and tell you all about it? I’m Amy Dingmann and life on our 5-acre Minnesota homestead keeps me busy. I work hard in the barn, the garden, and the kitchen. Come hang out with me while I share a real and hilariously truthful look at what it’s REALLY like to live a farmish kind of life. You can find links to all our episodes and show notes below—the list is updated as new episodes are added—but I also encourage you to subscribe to our podcast within your favorite player. You’ll be notified and able to listen to new episodes as soon as they are uploaded. You can subscribe in iTunes, Stitcher, Google Play Music, PlayerFM, as well as other popular podcast players. 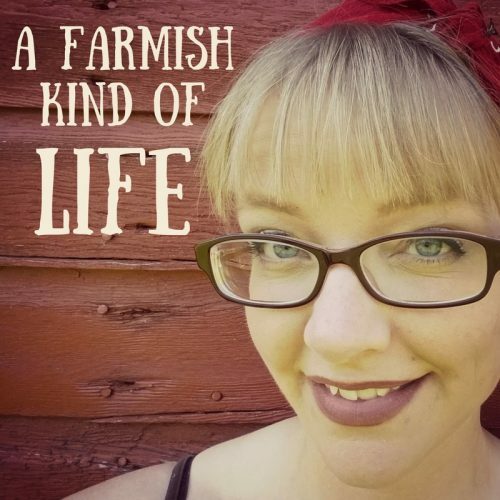 While at your favorite podcast player, I’d love it if you could rate and review Farmish Kind of Life Podcast. Ratings and reviews help other people to know that the podcast is pure awesomeness and encourages them to give it a listen themselves! New episodes are uploaded weekly. I welcome your questions, comments or suggestions—feel free to leave them in the comments below, or you can email me at amy(at)afarmishkindoflife(dot)com.